Governments are well-intentioned when it comes to social programs, but oftentimes they focus on the amount rather than the quality of services provided. Funding for prevention is especially susceptible to cuts, making it difficult to consistently fund the programs, let alone evaluate their effectiveness. A new model rigorously assesses the outcomes of social projects and leads to additional government savings by taking a preventive, rather than remedial, approach. Commonly known as a social impact bond, it does not require the government to issue a debt instrument; rather, it’s an innovative model in which the public and private sectors partner to focus on alleviating social problems more efficiently. 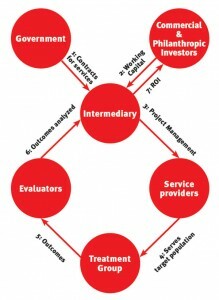 A 2012 report from McKinsey and Company titled “From Potential to Action” describes five major stakeholders involved in a SIB agreement: government, intermediaries, investors, service providers and evaluators. The government entity initiates the process by determining what kinds of preventive programs it wants to engage in. It then contracts an intermediary to bring together the other parties with whom it will form an agreement with specific outcomes and timelines. Intermediaries are responsible for coordinating the strategy and achieving the government’s desired outcomes. They find investors who will provide the working capital, and they oversee the service providers’ execution of the project. If the project is successful, the government repays investors through the intermediary. The investors involved may be either commercial or philanthropic. If the government’s desired outcomes are not achieved, the losses fall entirely on the investors, not the taxpayers. However, if the program is successful, investors will make back their principal with a modest return on investment. The greater the margin by which the project exceeds its specified outcomes, the greater return investors receive. Service providers administer the programs to the target group as designed by the intermediary. They benefit from the approach because it provides them with reliable long-term funding and the opportunity for broader involvement with governments. It also allows them to take solutions that have worked on a small scale and expand them in future projects. Evaluators are divided into two distinct roles: evaluation advisers and independent assessors. Evaluation advisers determine how the project will be evaluated, monitor its progress and suggest corrections if they are needed. Independent assessors oversee the randomized control trial to verify that the outcomes have been met to the government’s specifications. With this information, the government knows whether or not investors can be repaid according to the terms of the SIB contract. The model allows them to experiment with innovative solutions without having to take the risks that would normally go with them. When these experiments are successful, they lead to savings because the government is preempting problems instead of focusing on remedial treatments. Social impact bond projects have typically been successful in areas such as recidivism reduction, workforce development, supportive housing for the homeless, preventive health care and early childhood education. According to Tracy Palandjian, CEO of Social Finance US, a SIB needs to unambiguously articulate the criteria for success. Palandjian described several important factors to consider when forming a SIB contract. First, a government needs to determine the financial value of the project, not only for its own sake — to make sure the benefits will outweigh the costs — but also for the sake of presenting the case to investors, who will want to see that there is a good basis for making an investment. Second, precautions need to be taken to ensure that there will be no unintended consequences and that there are no perverse incentives in the contract that will harm the target population. Next, the interventions need to have a high degree of likelihood for success and service providers must be available to make it happen. The government should also set specific time frames for achieving its goals: typically within three to eight years. Finally, the results need to be measurable.This requires adequate administrative data. The collecting and analyzing of data in a SIB program is intensive, and technical assistance from an outside source will be needed if the expertise is not available in-house. Along with evaluating the program’s effectiveness, data analysis can spot redundancies in the system, such as constituents who are receiving similar services from different government agencies. Almost all current SIB programs are being administered at the state level; however, Jessica LaBarbera, director at the Nonprofit Finance Fund, believes that there is nothing inherent in the SIB structure to prevent municipal governments from participating. She suggested three points that leadership should consider. First, leadership needs to think about how much of the savings will be experienced locally. “Some of the savings from the program might accrue to the federal or state level instead of the municipal level,” she said. “It’s important to determine which savings associated with positive outcomes are captured locally. “Secondly, it’s innovative, so in its early years exploration costs are going to be high,” LaBarbera added. It’s challenging to solicit stakeholder support and conduct intensive data analysis at the municipal level. Highly skilled legal and IT personnel are needed to make the project work, and these costs relative to the size of the project can be prohibitive. Lastly, it is important to determine whether there is an opportunity to reach a significant portion population at the local level. Not only does the target population need to be large enough, but there also needs to be a significant control population for evaluating the extent of the target group’s progress. Social impact bonds could be attractive to municipalities that want to improve their accountability and take a preemptive approach to social programs. If the model gains traction, it has the potential to change the way that governments provide services in general.